Day 20 – Why Do I Edition My Own Work? Yet more editioning – today I was inking up the third block in two tones of the same yellow, the idea being to introduce some depth to the scene and variety to the light. Plenty of printmakers don’t do their own editioning. It takes up a lot of time which, one could argue, might be put to better use actually creating the prints. Personally, I always do my own printing as I’m a bit of a control freak/perfectionist (such attractive traits) and deep down I feel that no-one will be able to print my linocuts the way I like them done. Successful printmakers often pay someone else to print their editions. Either they train up a printmaking graduate, sometimes offering free use of their studio facilities as part of the deal, or they use a professional print-editioning studio, which is eye-wateringly expensive. Unfortunately, I think I’d quickly get to the point where I’d be waving a sketch, done on the back of an envelope, at my editioner and asking them to make a print from it. 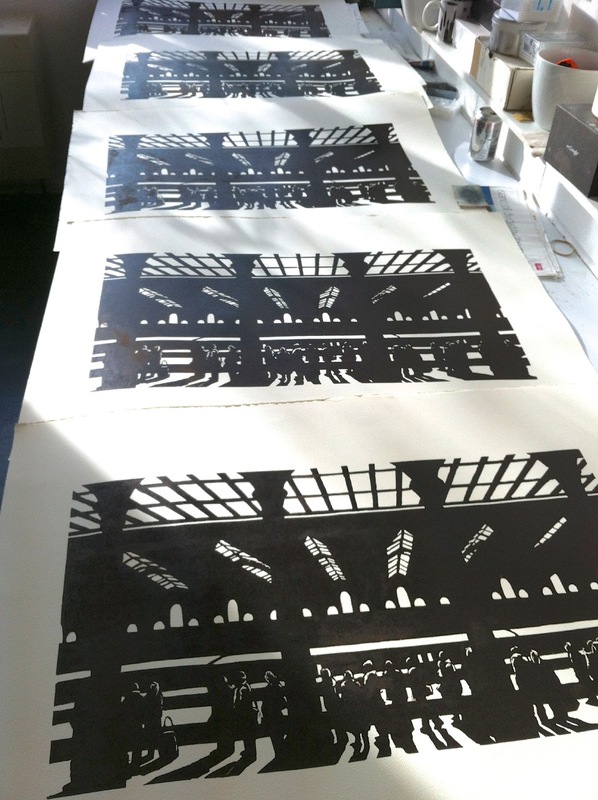 Hard at work in the studio again today, editioning nine of these prints. I tend to pull a proof first and then do a little more trimming and adjusting of the block so it can be a slow process. Still, two colours are on and drying, two more to go. 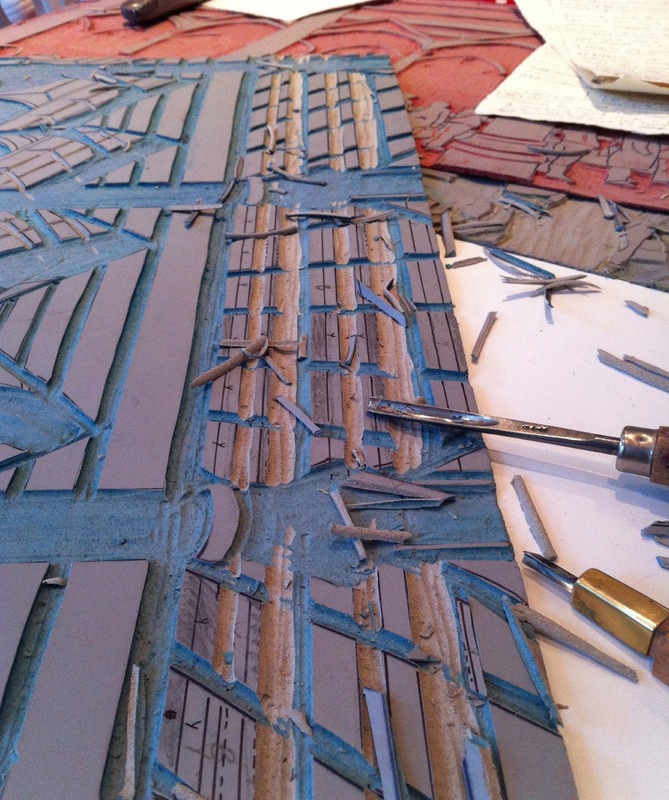 Can’t wait to finish – this one’s been a bit of a marathon…. Day 18 – Why Am I Doing This Again? This week I will be editioning in the studio – whilst trying to remember why I thought blogging every day in February was a good idea. The more observant reader may have noticed that I have quietly stopped posting at the weekend – mainly because lying on the sofa eating crisps and watching TV all day is not that interesting to write (or read) about. It’s not easy to find something interesting to say/photograph every day, without repeating yourself and really, printmaking in itself is quite repetitive – strangely enough, all those glamorous openings and private views have not materialised this month…. So it’s just me plodding along, racking my brains for something new and exciting to write about – and did I mention I’m supposed to do this EVERY DAY??? I think I can safely say that these will be the last ever proofs of this linocut – I finished them today – and I’ll be making some decisions about them over the weekend. Finally, I’m reasonably happy with these – so I think I’ll carry on printmaking for now. I guess I won’t be trying to get a proper job. Tesco is safe for the time being….. In the end, I decided to print in two tones of the same colour on the third block, in order to get some more depth. The trouble with using the same colour all over was that, in order for the yellow on the platform to create a strong light effect, by comparison the yellow in the little arched windows at the back was far too strong and kept jumping forward. So I used a slightly denser yellow (lemon yellow, olive green and some white) on the top and bottom sections, and just added more white to the middle section. Anyway, I have three slightly different versions of this proof, on which to experiment with the last colour – I sort of wish I had thirty…. Day 13 – Taking Notes….. I like to jot down the odd thought whilst I’m working – sometimes it does get a bit out of hand…. And a quick bit of printing later, here is a proof. The paper has come out a bit yellowy, which I quite like – maybe I should have a creamy-yellow next, rather than that slightly sharp lemon. Hmm…. Today I’ve mostly been staring at these four different proofs. They’ve been stuck up on the studio wall and I’ve come to the reluctant conclusion that none of them are working (in other words, they’re all horrible). Not only that, but I’ve completely lost sight of what I was aiming for. Still, I do like a challenge and so I’ve decided to do one last batch this week. And if they’re still unresolved – well, I may have to go and work at Tesco’s…. I thought I’d catch up with a spot of editioning in the studio, while I do what I think of as ‘mulling over’ the other work in progress. Although to be truthful, it’s more a bad case of ‘let’s not think about it today’. From the top, the first block is printed in a deep purple, the second block is overprinted with primrose yellow and then a close-up of some of the crowd of passengers at the bottom. It’s looking fine at the moment but this is where it all went wrong last time…. admin on New book is here…. Cathy Kravitz on New book is here….